A Queue is a collection for holding elements prior to processing. Besides basic Collection operations, queues provide additional insertion, removal, and inspection operations. These methods throw an exception if the operation fails. boolean add(E e) - Inserts the specified element into this queue if it is possible to do so immediately without violating capacity restrictions, returning true upon success and throwing an IllegalStateException if no space is currently available. E element() - Retrieves, but does not remove, the head of this queue. E remove() - Retrieves and removes the head of this queue. These methods return a special value if the operation fails (either null or false, depending on the operation). 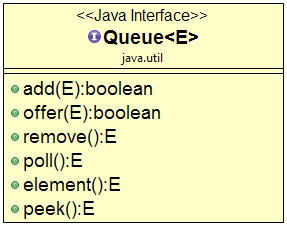 boolean offer(E e) - Inserts the specified element into this queue if it is possible to do so immediately without violating capacity restrictions. E peek() - Retrieves, but does not remove, the head of this queue, or returns null if this queue is empty. E poll() - Retrieves and removes the head of this queue, or returns null if this queue is empty. Queues typically, but not necessarily, order elements in a FIFO (first-in-first-out) manner. Among the exceptions are priority queues, which order elements according to their values. Whatever order is used, the head of the queue is the element that would be removed by a call to remove or poll. In a FIFO queue, all new elements are inserted at the tail of the queue. Other kinds of queues may use different placement rules. Every Queue implementation must specify its ordering properties. It is possible for a Queue implementation to restrict the number of elements that it holds; such queues are known as bounded. 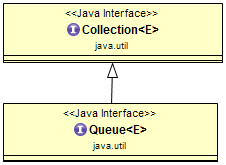 Some Queue implementations in java.util.concurrent are bounded, but the implementations in java.util are not. The below diagram shows a list of methods Queue interface provides. Queue interface extends Collection interface and provides provide additional insertion, removal, and inspection operations. * Demonstrate Queue interface methods with LinkedList implementation. // The poll() method is similar to remove() except that it returns null if the Queue is empty. Let's demonstrate Queue interface methods - isEmpty(), size(), element(),peek() with examples. Check if a Queue is empty. Find the size of a Queue. Search for an element in a Queue. Get the element at the front of the Queue without removing it. Iterate over a Queue using Java 8 forEach() method. Iterate over a Queue using iterator(). 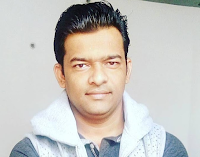 Iterate over a Queue using iterator() and Java 8 forEachRemaining() method. Iterate over a Queue using a simple for-each loop. The iteration order in a Queue is the same as the insertion order. * Iterate over Queue with different approaches. LinkedList Class is a general implementation of Queue Interface.